On November 23rd, our last day of the Trans-Pecos trip (these travel posts aren’t sequential), we went out while it was still dark in hopes of seeing a good sunrise. 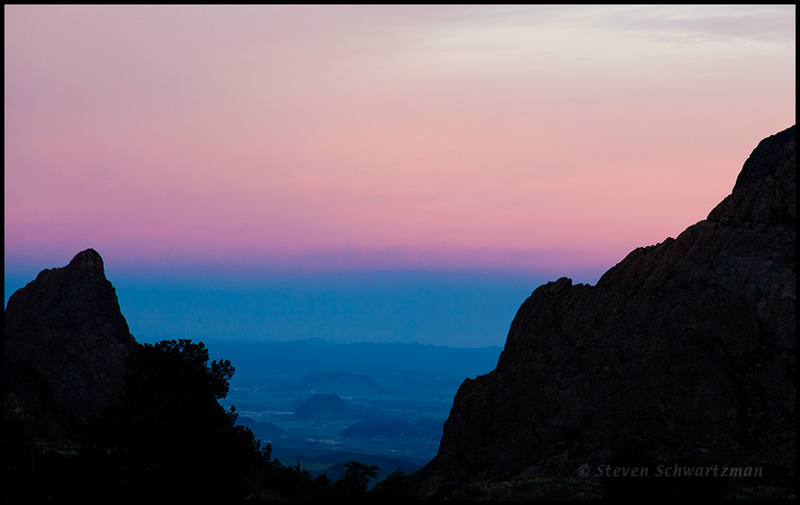 Though we didn’t get a fantastic one, we did see some pleasant early-morning colors from the Chisos Mountain Basin in Big Bend National Park. Loving the Belt of Venus as I do, I’d say you were well-rewarded by your own early rising. This is one of the most unique captures of the phenomenon I’ve seen, with the valley floor limned by the same shadows that edge the horizon. Usually, I see this only as an atmospheric phenomenon. It’s amazing to see both heaven and earth involved, and quite beautiful. I like the addition of the black border around the image, too. I normally use a black border two pixels wide to differentiate the edges of my pictures from the white of the page (and this WordPress theme includes an extra little frame), but once in a while I use a broader black border when I feel it will add something. If I can mix metaphors, I’d say your opinion is that I’ve belted one out of the park with this sunrise photograph. The fact that the park was Big Bend means that I was playing in the National League. Thanks, and a colorful morning to you, Nora. You don’t call THIS one fantastic!?!? You raise a good point, Elisa. When we were still down on the desert floor, shortly before turning off on the road that took us up into the basin shown here, we saw a display of brilliant colors in the distance to the east, but it was a narrow band close to the horizon and therefore not anything I could get a good picture of. Compared to that, this diffused afterglow didn’t seem so fantastic. That’s why I described it with the word “pleasant,” which it was. And a worthy place to visit every so often. It was still relatively quiet, although by then many of the campers and lodge-stayers at Chisos Basin were stirring and the restaurant had opened for breakfast. I can only agree with Linda on this stunner. Beautiful, breathtaking view and a great spot to witness sunrise! Great shot Steve! Thanks, Eva. I hope you get to visit Big Bend if you haven’t ever (or recently) been there. Bellísima imagen, una foto perfecta, Steve. Big Bend es una buena combinación de desierto y montañas. Amazing view, the colors for the day are beautiful. It was a good beginning to the last day of our trip. Very nice landscape with the Belt of Venus, Steve…as noted above by that lover of Venus Belts, Linda. I like the subtle landscape revealed in the cleft of the mountains. It was the cleft that made the picture possible; otherwise there wouldn’t have been a direct view out of that basin in the Chisos Mountains. I may have photographed the Belt of Venus, but I wasn’t aware of it at the time. It’s something different from Texas for you. It’s good to hear you accepted the invitation. So much depends on expectation. I was hoping for the spectacular type of sunrise you described, so this subtle one initially disappointed, but I’m still glad to have experienced and recorded it. People here have reacted well to it, even endowing it with mystery the way you have done.